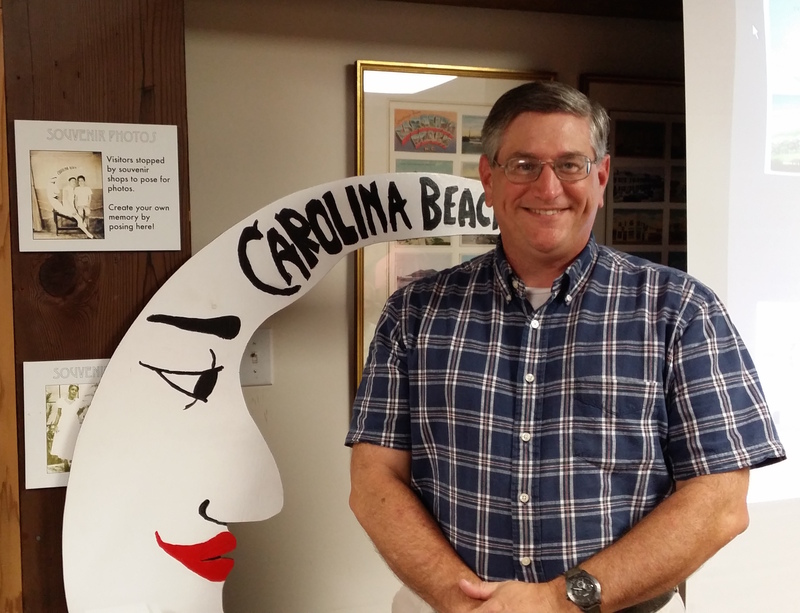 John Moseley, Assistant Site Manager at the Fort Fisher Historic Site and History Center Board member, spoke on World War II and Fort Fisher at the regular monthly meeting of the History Center on Monday, September 21, 2015. 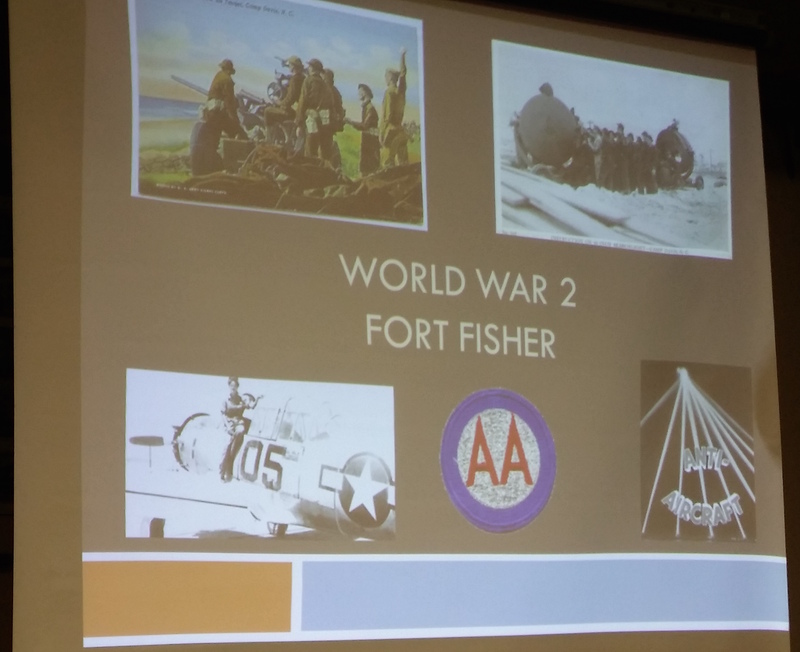 He started by explaining how Fort Fisher came to be a World War II base. President Roosevelt wanted military installations built where artillery shells could be fired and no one would hear them or be injured by a bad aim. Eastern North Carolina was determined to be the promised land, or at least sufficiently in the middle of nowhere, for such installations. So in 1940, Holly Ridge, with 7 houses and a population of 28, was transformed from a fuel stop for the Atlantic Coastline Railroad into Camp Davis, an anti-aircraft artillery training center that would house 110,000 people by 1943, at the cost of $40 million. Fort Fisher, 50 miles to the south, became the primary firing range for Camp Davis. Because of the distance between the two, Fort Fisher had to be a self-sufficient base. Although Fort Fisher was critical historically because of its role in the Civil War, in 1940 national defense took precedence over historic preservation. 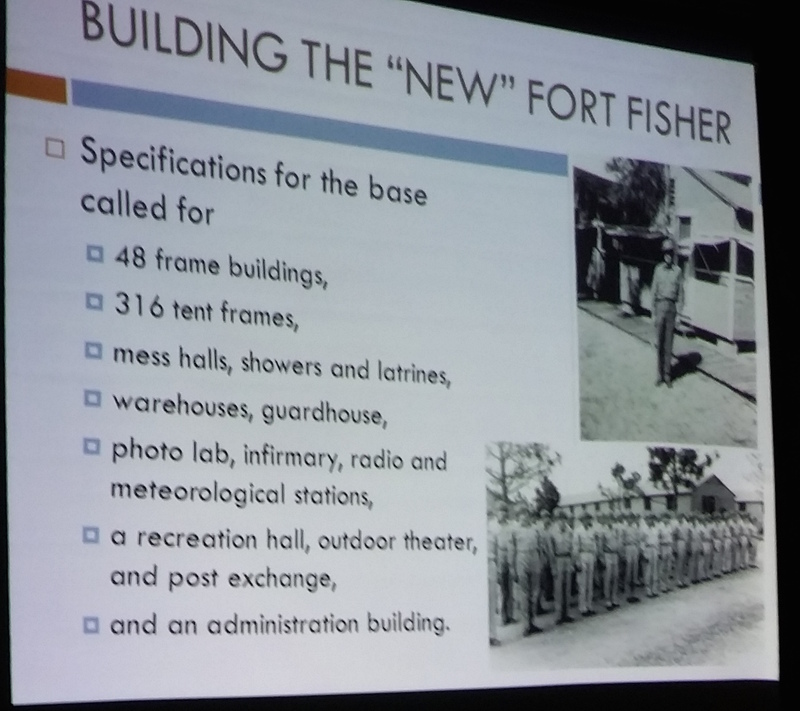 Fort Fisher was transformed into a tent city, with over 300 tent frames, 48 buildings, mess halls, showers, infirmary, photo lab, radio and meteorological stations, as well as an airstrip running through the middle of the Fort. Many of the soldiers arriving at Fort Fisher for their weapons training rotations came from the Midwest, and they had to adjust to a new and challenging environment: the barracks were very small, and the mosquitoes were very large. 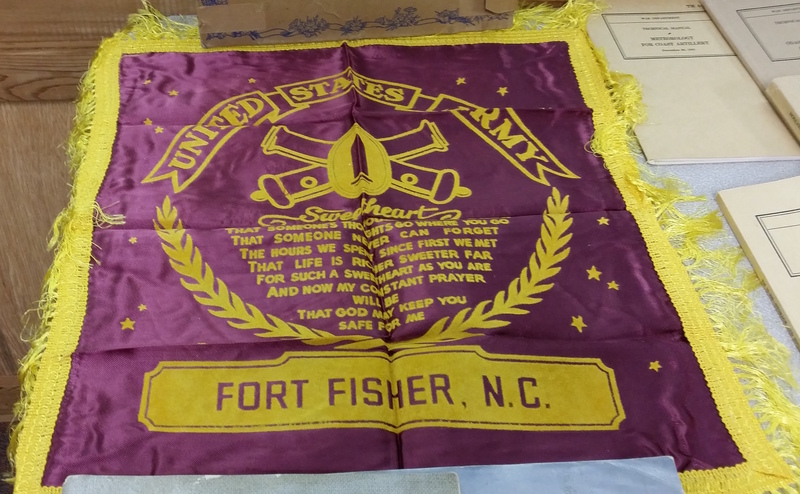 One soldier described Fort Fisher as “a quagmire of sand, sand, and more sand.” Some complained about the unfamiliar food: clams, fried shrimp, oyster stew. Still, many men enjoyed the beach and ocean, with reports of sunburn and even surfing attempts using government-issued mattresses. 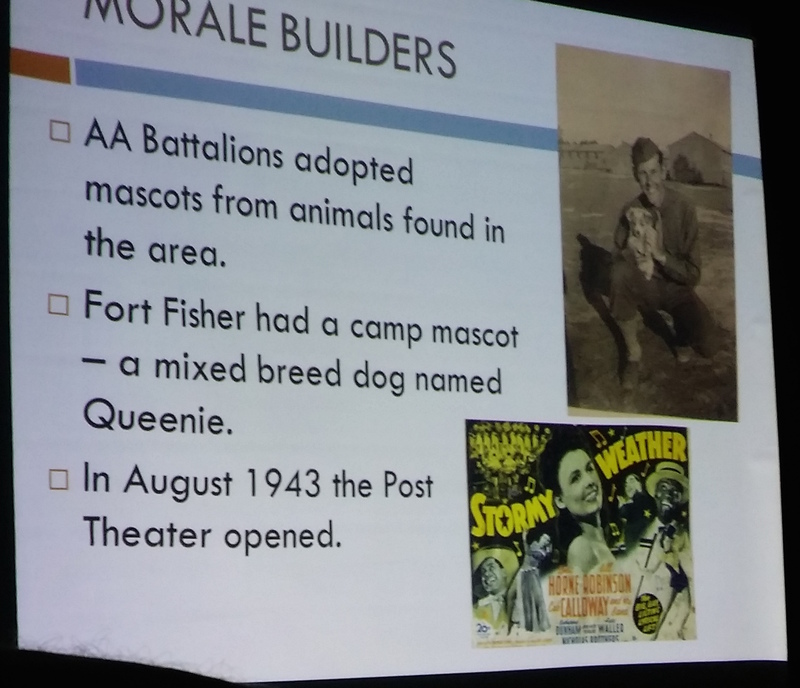 There were sports teams, and Fort Fisher had a canine camp mascot named Queenie. Eventually an indoor movie theater was built for the troops, to the dismay of the local mosquitoes which had enjoyed the original outdoor theater far more than the soldiers had. Artillery training took place along and above the beaches, much as it had during the Civil War. The Women Airforce Service Pilots (WASPs) became a critical part of the weapons training as they piloted planes towing aerial target sleeves for the artillery trainees to shoot at. WASPs had to fly every type of aircraft in this role, and also conduct radar deception and tracking missions. At least 43 anti-aircraft battalions trained at Fort Fisher before heading to battle in Europe and the Pacific. Before they left, many of those men sent home sweetheart pillows like the beet red satin pillow John shared with the audience near the end of his presentation. These pillows were popular during World War II, sent to loved ones by young men as a remembrance, along with the fervent hope they would eventually return home safe and reasonably sound. That God may keep you safe for me.